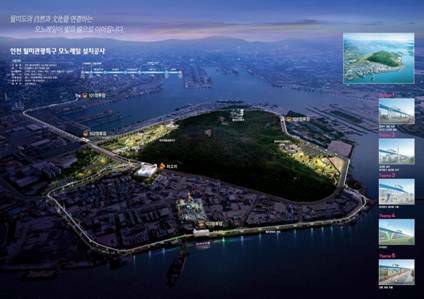 The water front loop around Wolmido Park, Incheon, South Korea has a new, architecturally aesthetic Y-shaped structure patented by Urbanaut bridging 45m (150ft) between supports. 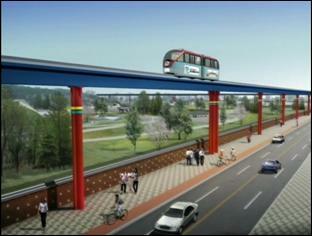 The guideway crosses a freeway at 20 meter (66ft) height with adjacent sections having 6 to 7° grades. The guideways are elevated and apply 3 different Urbanaut types of structures in concrete and steel. Expansion of a dual guideway from station 109 has been planned. 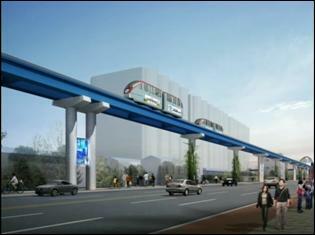 The Urbanaut Incheon Monorail initially consists of 2-car trains, expandable in the future to 3 or 4-car trains. A dual guideway extension further into the city center is planned from Station 109. The system is fully automatically operated and controlled, including service and maintenance which are integrated into the management facility. Urbanaut stations are smaller modern expandable types, harmonized aesthetically into the surroundings with integrated efficient access to the ferries, the metro light rail and possible expansion to the airport. The Wolmido Park is a popular tourist center and the Urbanaut is expected to further stimulate this industry. 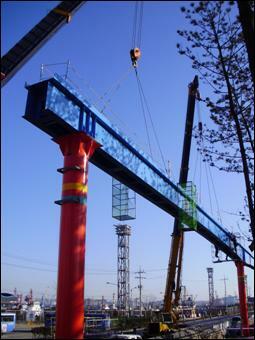 In the following section are numerous illustrations of the Incheon Wolmido Urbanaut construction and facilities, including vehicle concepts and operation. Along the Wolmido waterfront and public boulevard, an especially graceful architectural/structural concept was selected which was invented and patented by the Urbanaut Company. This new structural concept has great flexibility and bridges 45 meters (150 ft) between pile foundations, a record by more than 50% between foundations, compared with other monorails. This is one of the many examples of technical, economically and environmentally superior features of the Urbanaut. 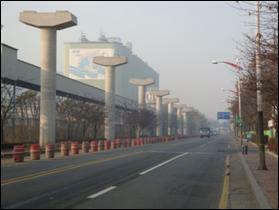 The Wolmido Monorail in Incheon City, South Korea, is a medium size Urbanaut project that involves partial prefabrication and limited on-site construction. The construction method chosen uses lightweight less costly equipment, involves a limited number of skilled workers and innovative, safe assembly techniques. It has been used in regions where the cost of labor is favorable, and where heavy equipment is hard to obtain at reasonable costs. The foundation for this particular project was complicated and costly since the water table was high. It involved inserting pilings (some 30 meters deep) down to bedrock with pile cap foundation to support the super-structure (above the ground). 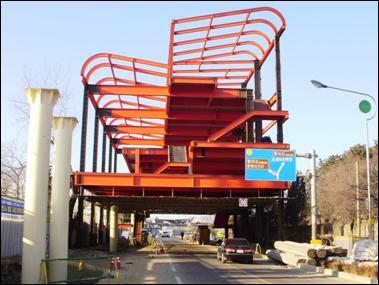 To limit the number of expensive foundations for the elevated guideway Urbanaut recommended a special long span elevated structures. The Dual Guide way super-structure is concrete. Urbanaut provided a preliminary design and engineering of circular concrete columns with the same cross section up to 20m (66ft) in height. Prefabricated of circular column reinforcement cages (Illustration 1) was made adjacent to the site and trucked to each support; then installed on top of the foundation (Illustration 2). 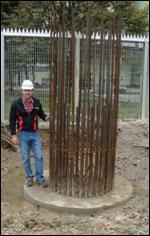 To become cost effective the amount of reinforcing varied and diminished with the height of each column. 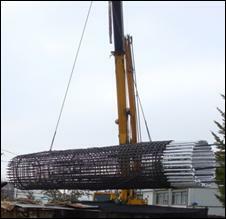 The contractor designed a simple, effective repetitious slip form section (Illustration 3) requiring just a few skilled employees. The speed of construction in this case is related to how many slip forms are used, since several columns are slip formed and poured simultaneously. The form work and procedure was applied for dual guide ways, with a special form for the T-shape cross member at top used repetitiously (Illustration 4). The Single Guide way super-structure consists basically of 2 prefabricated steel components – circular columns and U-shaped beam sections. The composite beamway on top of the columns has a concrete slab serving as runway for the vehicles and is precision poured on site. The concrete guide rail on top, in the center of the runway, is made in sections with fine tolerances. For an Urbanaut Monorail guide way construction to be cost effective, planning and scheduling prior to construction is imperative. Construction involves skilled labor and technicians in addition to a survey crew and engineering inspection that overlooks precision installation of components. Long Span Dual Elevated Monorail Steel Beam Way on top of slender circular concrete T-columns. Construction causes no interference with adjacent high speed highway. The Elevated Guide way with fairly steep grades crosses above a major highway at a height of 20 meters / 66 ft Urbanaut rubber tires on the concrete runway has traction ability for grades up to 12%. Prefabricated steel sections to be topped with a concrete slab have shear lugs (studs) to make a rigid composite beam section. A precision cast-in-place concrete runway allowing a small beamway deflection provides a smooth, quiet vehicle ride for the rubber tired vehicles. The Wolmido Project involves testing of 4 different types of guide way structures in steel and concrete, bridging up to 45 meters (150 ft) between foundations, nearly twice the length of other monorails. The guide ways are constructed off street with no interference with traffic. An Urbanaut Dual Guide way has high passenger capacity. A Single Guide way with 2-car train leaves a small foot print along a spacious sidewalk. Special simple and inexpensive Urbanaut stations bridging streets and street intersections, with easy convenient access by stairs and elevators, close to parking garages and other transit – buses and light rail - will stimulate use of the system. The stations are constructed without street traffic interference. v With the advent of the new innovative Urbanaut monorail technology an entirely new perspective has evolved in making feasibility studies for alternate monorail transportation planning, design and engineering. 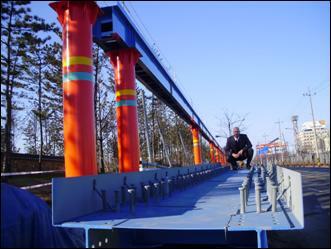 v The new much less costly and flexible modern Urbanaut system beginning operation in Incheon, S. Korea in 2009 revolutionizes the concept of planning monorails for effective and less costly environmentally friendly transportation systems in our crowded cities and communities. This non-polluting, noiseless, innovative system can be built along existing right of ways for highways and freeways. v The Urbanaut system not only costs much less per passenger and kilometer, but also allows much more flexibility in design, adaptation and ease of future expansion, with the ultimate goal to provide much better service for the public, an important enticement to maximum use of any transportation system. v City planners, developers, transportation agencies on federal and state levels, and colleges and universities need unbiased studies of current and emerging state-of-the art alternatives in transit planning. They no longer need to limit their feasibility studies to the 50-year old straddle monorail derivatives and antiquated steel wheel/rail concepts which have monopolized the world market in spite of their limited flexibility, adaptability and costliness. With the new Urbanaut as an alternative, many professionals and in particular, citizens, now accept the fact that the old straddle concept is far from the state of art for future monorail technology. v Urbanaut will, under a Preliminary Feasibility Agreement, discuss proprietary and other helpful documents, illustrations, videos, guidelines of costs and advice to minimize unexpected problems and give guide lines to help advance a project for further study. It is in the Urbanaut's interest to make a project cost effective and profitable for the many contractors, consultants and agencies involved. 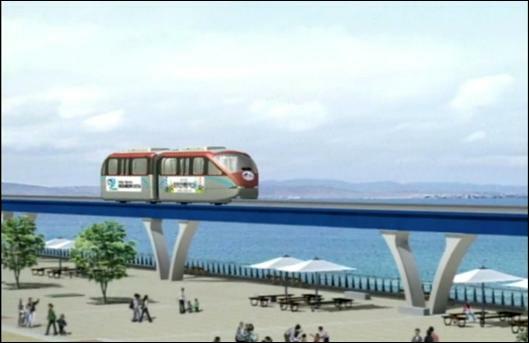 The accompanying photo is from a Preliminary Feasibility Study made of the first stage of the Incheon Wolmido Urbanaut Monorail Project. For the Wolmido Park Loop a special attractive long span elevated Y-shaped patented Urbanaut guide way structure compatible with the beautiful park and ocean environment was recommended and accepted. For the rest of the project, vertical shorter beam spans with steel and concrete columns were applied. Stations are approximately 0.6 km apart; the guide ways are all elevated. Stages II and III are approved and under construction.